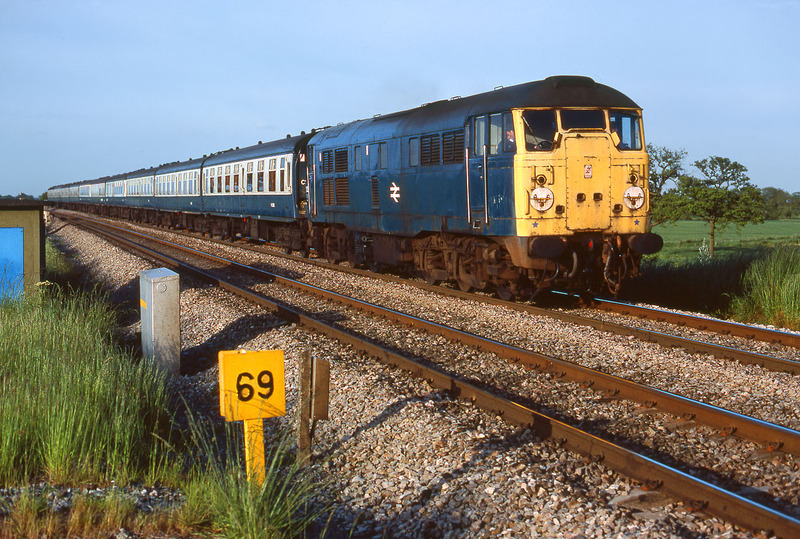 Running 35 minutes late, 31105 passes Knighton on the balmy evening of 12 June 1983 with the 5C83 18:25 Paddington to Cardiff Canton ECS. The stock had earlier formed the 1A83 12:50 Milford Haven to Paddington, but I doubt if the venerable 31 had been employed on that. This picture is taken from the site of the former Knighton Crossing, which had been made redundant by a new underbridge in the early 1970s. At this time it was still possible to stand on the old roadway, which had yet to be securely fenced off from the line. Although not a particularly scenic location, it did give a nearly uninterrupted view of westbound trains on a late summer evening, albeit slightly impeded by the old PW hut and assorted lineside paraphernalia.